In addition to interviews and archival research, CTD researchers are encouraged to use their senses, visuals, and digitalization during and beyond fieldwork in order to collect data. In April 2014, CTD researchers in collaboration with external collaborators and supervisors, explored and defined these methods as part of the workshop ‘Methodologies under Duress’ in Buea, Cameroon. For a detailed report of their hands-on exploration of the methods during this workshop, click here. 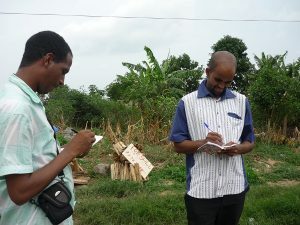 CTD researchers Adamou Amadou & Boukary Sangaré in Buea, Cameroon, April 2014. CTD researchers are encouraged to use their sense of hearing, sight, and smell in the field. These data are captured through photo and video recording (sight), audio recording (hearing), and olfactory memory (smell). The various senses are employed in concert, to appreciate the field in its totality. An absense of sensing is also incorporated in this method: one strong sense can easily overrule the other senses. Visuals (film, photography, digital) have multiple uses in the CTD project: promotion, presentations, teaching, and as data. Like audio data and written texts, visuals demand a procedure of collecting, archiving, and analysis/ end product. In the process of recording eyewitnesses, one of the primary visual methods, it is crucial to realise the importance of the editing process in discovering what is collected but also what is missing from a story. In studying new visual media, the CTD researchers are required to embrace, join, and become part of these media. The CTD project takes a pioneering stance in the virtualising of the research environment. This has consequences for the researchers working in this kind of environment. Digital connecting and archiving are integrated in the methodology of the CTD project: CTD researchers are encouraged to connect with both reseachers and the public to share their digital archive of research data. Related project Bridging Humanities – a peer-reviewed and academically recognised publication that aims to promote a methodology of knowledge production that integrates the use of digital sources in research – explores these possibilities further. CTD researchers frequently use digital data from online social media such as Twitter, Facebook and WhatsApp. Online social media, however, require interaction, affecting methods and epistomological approaches. See a.o. Mirjam de Bruijn’s contribution in ‘The Routledge Companion to Digital Ethnography’.